• Old forests are complex ecosystems with trees of all ages and stages including massive living old trees, young trees in a well-developed understory, and also large standing dead and fallen trees. In addition there are various layers of shrubs, herbs, mosses, as well as a host of animal species, some entirely dependent on old tree habitat. • By about 140 years of age, forests have developed structural complexity that contributes to increasing biodiversity as they age. Very old forests are defined as over 400 years and they exist only as remnant trees in inaccessible, marginal or protected areas. • Forest ecosystems exchange oxygen for carbon dioxide and are a significant store of carbon. They contribute to clean air and mitigate climate change. 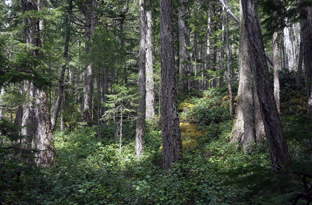 Current research shows that coastal forests in BC store 600 to 1300 tonnes of carbon per hectare. DIEM has mapped Old Forest Ecosystems brown in the Sensitive Ecosystems Mapping. Old forest ecosystems are conifer-dominated stands with many large trees that are at least 140 years old, and other trees of different ages, sizes and species that form a deep, multilayered canopy with numerous small gaps where trees have died or fallen. The understorey typically includes include patchy shrubs and herbs and layers of needles, twigs, and mosses. Complexity develops as a wealth of wildlife find habitat and forage: birds and small mammals build nests and find food in snags, fungi and seedlings take root in fallen trees (nurse logs), understorey vegetation flourishes under canopy gaps. Lichens, mosses, and insects thrive high in the forest canopy, and fish find excellent homes in many cool streams. 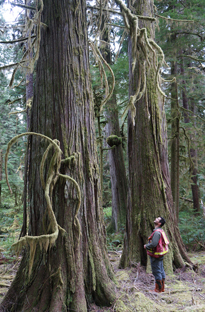 Common tree species include Western hemlock, Western redcedar and Douglas-fir. Remnant patches of old forest ecosystems exist in areas with a history of minimal human disturbance, but most old forest in the Discovery Islands has been fragmented by roads, logging, and development. Individual old trees or patches of old forest ecosystems tend to be in areas that were formerly inaccessible for logging or the trees were considered to be of inferior quality. Some of these are now accessible and sought for their value as timber. Intact old forest ecosystems provide essential habitat for endangered animals and rare plant communities. Their high biodiversity makes old forests invaluable as ecological refuge for species that can later disperse to nearby maturing forests. When old forest ecosystems become too fragmented, the refuge is lost and overall forest biodiversity of the region is diminished. 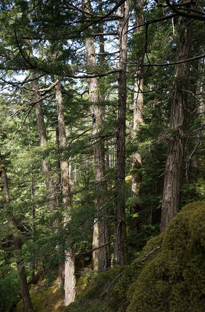 In addition to their ecological functions, old forests provide the human community with non-timber forest products such as salal, wild mushrooms, berries, medicinal plants, and opportunities for research and education, recreation, and ecotourism. Old forests also nourish our spirit. TAKE CARE when you go off trail in an old forest ecosystem: Plants and animals live everywhere among the decaying wood, moss, and other undergrowth. TYPICAL FLORA Amabilis fir, Douglas-fir, western hemlock, western redcedar, western yew, dull Oregon grape, red huckleberry, step moss, deer fern, sword fern, electrified cat’s tail moss, bunchberry, evergreen huckleberry, fairy bells, fairy slipper orchid, false azalea, false lily of the valley, foam flower, ground cone, lanky moss, licorice fern, Oregon beaked moss, oval-leaved blueberry, pinesap, pink wintergreen, rattlesnake plantain, red huckleberry, running clubmoss, spiny wood fern. 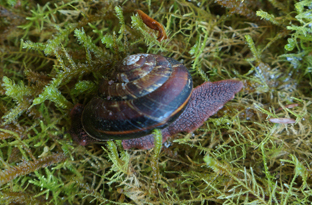 Pacific sideband is BC’s largest land snail. The body is pinkish brown with a pebbly, textured surface and the shell ranges from dark brown to lighter with a dark line on each whorl. 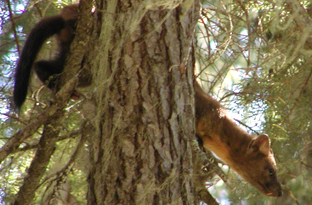 Pacific sidebands climb and feed on many forest plants. This snail is blue-listed in BC. 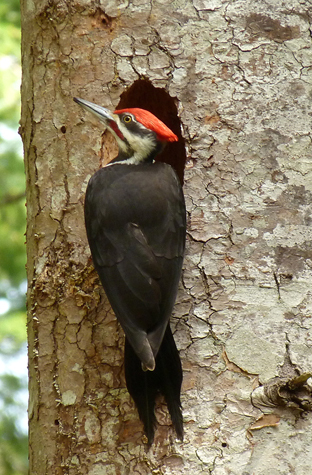 The pileated wood pecker, the largest woodpecker in North America leaves distinctive rectangular holes when excavating in rotting wood, often on or near the ground, for invertebrate prey. Fruit and seeds are also eaten. Nests cavities are made in trees and the territory is defended by loud drumming and calls. They are weasel-like with the approximate body size of a mink but with fluffy tails, longer legs and ears. They’re found in coniferous forests and feed mostly on small mammals and birds but also fruits, insects and marine shore life. They are actively trapped for fur. 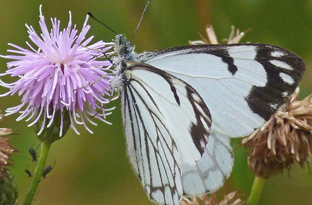 Pine white is a distinctive white butterfly and flies from late July to September. They are often high in the coniferous forest trees and population surges used to occur when older forests were intact. The latest in 1961 saw dying white butterflies in vast numbers floating on the sea and on beaches off Vancouver Island. 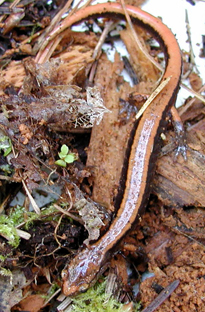 The western red-backed salamander’s coloration is suited to its habitat under logs and large woody debris in moist forests. As a lungless salamander that breathes through its skin, keeping moist is important. Like wandering salamanders, the eggs are laid in chambers in the woody debris, probably tended by the adults and the young hatch as mini adult replicas. 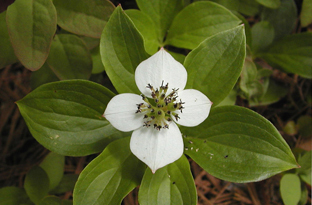 Bunchberry’s whorls bright evergreen leaves often trail along logs and up tree trunks in moist forests. It has and a dogwood-like flower and is in the same genus. 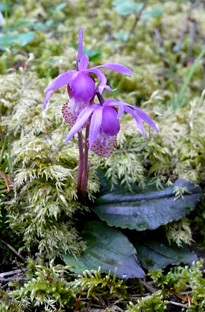 The tiny fairyslipper orchid is beautiful and fragrant. It grows from a small corm with a single dark green veined leaf in the fall that is followed by the slipper like blossom in early spring. 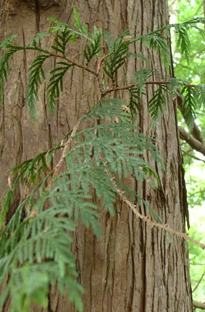 Called the Tree of Life, the western redcedar provided the material for many essential items used by First Nations, from housing and travel to clothing and food gathering. 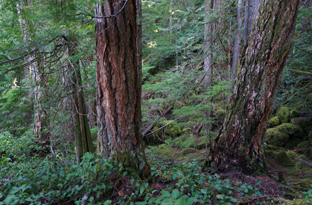 Redcedar grows mainly in moist areas at low to medium elevations. Only occasional small patches of Old Forest ecosystem remain in the Discovery Island; they are distributed in typically hard to access locations, with a few larger sites on Sonora and the Redonda islands. The site on the top of West Redonda is a protected provincial Ecological Reserve.